Picture the area south of Mayfield Road near Superior Road: a few scattered houses on Radnor and Hampshire Roads connected by cinder paths instead of sidewalks, no electric lights, and a creek that the residents use for their water supply runs through what is now Cumberland Park. Nothing along Superior Road except Mr. Preyer’s vineyard and a pond where the houses on Preyer Road now stand. With luck, a streetcar comes along every half hour or so. This was the scene when the Rev. Albert J. Alexander, pastor of Beckwith Memorial Presbyterian Church on Euclid Avenue, (later the Church of the Covenant,) decided to start a new church “up in the Heights.” In the fall of 1903, Rev. Alexander and a group of neighbors met in the home of Mr. L.B. Roessing on Hampshire Road to plan the beginnings of the new congregation. On the evening of November 11, 1903, Rev. Alexander conducted the first formal worship service with a congregation of 40 or 50 Cleveland Heights Presbyterians in a rented house on Radnor Road (at the time called Florence Avenue.) The Radnor Church House hosted weekly Sunday School classes on Sunday mornings and evening worship services for over 2 years. By February 1905, the church was known as the “Mayfield Heights Branch” of Beckwith Church. The branch continued to grow and in 1906 moved to the Superior Road School House at Superior and Euclid Hts. Blvd., using the lower floor for Sunday School and evening services. By 1908, the congregation had outgrown the old schoolhouse and purchased a lot for $5000 from Emil Preyer on the corner of Mayfield and Preyer Roads. The new building cost approximately $15,000 and was dedicated on Jan. 24, 1909. The congregation installed its first organ, at a cost of $1875, paid for by Andrew Carnegie and John D. Rockefeller. In September 1909, the church was still considered a branch of First Church (which succeeded Beckwith Presbyterian) even though the new congregation numbered 100. But in October 1910, the congregation decided it was time to have its own pastor and called the Rev. Edward S. Claflin of Rochester, N.Y. to lead them into their next decade. The future Forest Hill Church began its second decade in November 1913 with the Rev. Edward Claflin at the midpoint of his 6-year pastorate. The congregation continued to grow and just 3 years later, on April 7, 1916, its 164 members officially incorporated as Cleveland Heights Presbyterian Church (CHPC). They celebrated with a Jubilee Service which installed Rev. Claflin as the first pastor of the newly incorporated church. Unfortunately, 8 months later, ill health forced Rev. Claflin to resign. Supply pastors served CHPC until September 1917 when Dr. W.F. Dickens-Lewis begin his 17 years as pastor. In 1917, the Church purchased the former home of Rev. Claflin at 2877 Hampshire Road as a manse for Dr. Dickens-Lewis and his wife. Dr. and Mrs. Dickens-Lewis shepherded CHPC through a dynamic time in both church and world history, from World War I to the early stages of the Depression. When Dr. Dickens-Lewis was sent overseas as a chaplain, Mrs. Lewis led the youth and Sunday school programs and assisted the supply pastor, Rev. Hinds. After the war ended, CHPC membership grew significantly – to over 300 people – creating a shortage of space on Sunday mornings. Sunday school classes met wherever room could be found, including the choir loft, kitchen, and furnace room. The Church’s rapid growth and overcrowded Sunday school classes finally led CHPC in 1921 to build a 40′ x 80′ “temporary” Sunday school addition at a cost of $11,600. The addition was far from temporary, remaining a functioning part of the church building for 30 years. On Sunday mornings the space teemed with up to 250 persons and for Sunday evening youth fellowship it was “the place to be” for neighborhood high school students. As the Church grew, so did the budget, with the annual expenses of CHPC nearly doubling from $4627 to $8400 between 1917 and 1921. During this decade the Women’s Association became an important and vibrant part of the CHPC community, sponsoring events and helping to fund many improvements to the building. In November 1923, CHPC entered its 21st year still led by Dr. Lewis who remained as pastor for the Church’s entire third decade. Remembered by some older members as a “hell, fire and brimstone” preacher, nevertheless Dr. Lewis established the first Board of Deacons on May 14, 1924. The first Deacons were provided $20 to carry out their work, which included ushering, assisting with communion preparation, distributing pledge envelopes, participating in the “Every Member Canvas,” and assisting the minister with pastoral calls. This decade saw significant changes both in the surrounding community and in the church’s congregation and financial health. The early 1920s saw an increase in city services and the building of paved streets and sidewalks. To dedicate and pave Preyer Road, the City asked CHPC to deed five feet of church property to the city. The congregation rejected an outright donation of the property, but agreed to exchange the property for a reduction in the church’s paving and sidewalk assessment. Around this time, John D. Rockefeller divided his private Forest Hill estate, making part of it a park and creating the Rockefeller Allotment east of Lee Road, which would become the Forest Hill neighborhood. The developer laid out the streets, put in water hydrants, and built a few houses on Glynn, Brewster and Monticello Roads. The homes sold for an average of $3500 – $4000. But with the onset of the Depression in 1929, the Forest Hill development stopped and remained at a standstill until after World War II. CHPC faced similarly difficult times with both declining membership and finances. The Church considered everything from expansion, to relocation, to merger. In 1927, the situation became dire enough that Dr. Lewis led a discussion of an idea to consolidate CHPC with Windermere Presbyterian Church of East Cleveland. Although this merger did not occur and the Church survived the crisis of the Depression, the CHPC congregation numbered well below 100 people by 1933. CHPC began its fourth decade in the midst of the Depression. Dr. Dickens-Lewis’ pastorate ended in 1934. By the fall of 1935, the Church had fallen on hard times, with only 65 active members. But on October 17, 1935, CHPC installed a young, energetic preacher fresh from seminary, Clem E. Bininger. Rev. Bininger ushered in a dynamic period of growth in both members and activity. He sought and succeeded in bringing many young couples into the church. To encourage the involvement of young parents, Rev. Bininger established the Couples Class, an adult education class that met during Sunday School time. The group became an essential and vibrant component of Church life for many young couples, becoming the forerunner of many social groups within the church in years to come and today. Other new groups formed during these years. The Christian Fellowship League began meeting in the evenings to provide working women and young mothers an alternative to the Women’s Association. The Men’s Group provided male fellowship around evening dinners, often with guest speakers. The 50+ Club was a social group both for members and persons from the neighborhood. And of course, the Women’s Association continued to flourish with six different Circles. By July 1939, membership had grown to 417, eventually reaching over 500 during Rev. Bininger’s pastorate. Thanks to member contributions and a generous gift from the Fred W. Preyer family in honor of his grandparents, on whose land the church stood, the mortgage on the Preyer Road church was paid off in December 1939. The congregation celebrated with a dinner and mortgage burning, featuring such speakers as Cleveland Heights Mayor and CHPC member, Frank C. Cain. The start of World War II had a major impact of on the congregation. The November 1939 church newsletter (The Heights-Terian which began publication in June 1939) reprinted a statement from the Ministers’ Peace Covenant in New York, “Christian Pacifist Faith – An Affirmation” which called for church to applaud peace and denounce war. Many church members struggled with the call of their faith to speak against war at a time of increasing evil in the world. But by December 1941, The Heights-Terian listed many church members in the service and provided news about them. In January 1943, Rev. 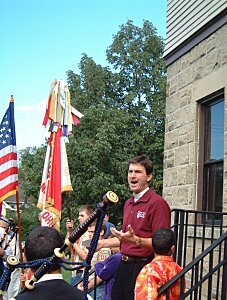 Bininger’s success led to his being called to serve a larger church in Wilkinsburg, Pennsylvania. In May 1943, CHPC called Claire M. Stewart as its next pastor, who served for 2 years. The 4th decade of CHPC ended with the unanimous vote to call Dr. Claire M. Stewart as pastor. He was scheduled to begin his work in September, 1943. Since the church had no pastor for the month of August, worship services were cancelled, but Sunday School classes continued, and the whole congregation was encouraged to attend. Volunteers were recruited to completely renovate the Manse before the arrival of the Stewart family. All wallpaper was removed and all ten rooms were repapered. The kitchen was modernized; the floors were refinished; and attic and basement walls were painted. The CHPC congregation worked diligently during this time to keep in touch with the church’s friends serving in World War II. Each month ten members gathered “newsy bits about Cleveland goings-on: how the Indians were faring, the victory garden, weather, etc.” Their news was edited into a two-page letter sent to over 65 members of the military. At Christmas time the congregation sent care packages to the soldiers whose letters of appreciation are quite touching and sincere. In 1945 the men began coming home from the military. CHPC formed a committee to assist in their re-adjustment to civilian life. Unfortunately, Dr. Stewart left CHPC after only two years, departing in the middle of a new building campaign. In May 1945, the congregation met to decide whether to enlarge the current church for $100,000, or to construct a new building for over $200,000 on the Rockefeller allotment at the corner of Monticello Boulevard and Lee Road. The new site offered room for unlimited expansion and a large parking lot, and was “within reasonable distance from the Mayfield street car line.” They considered consolidating with other churches in order to afford the new building. But since the government would not allow any construction for at least 2 years, the congregation had time to consider their decision. During this time Dr. Herbert Hinds became CHPC’s supply pastor. Dr. Hinds received 25 new members into the church on Easter of 1946, a remarkable feat for a church without a regular pastor. The inconsistency of leadership ended on April 5, 1946, when Rev. Yoder P. Leith, a dynamic young Army chaplain, was installed as pastor. Under the tutelage of Rev. Leith, membership steadily grew, as did the need for a larger church building. On October 1, 1946, the congregation purchased the section of John D. Rockefeller’s father’s farm at the intersection of Monticello and Lee. Construction of a Georgian Colonial church began in May 1950, with everyone in the congregation having a chance to dig into the ground with souvenir shovels provided by Rev. Leith. 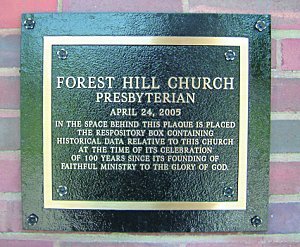 On September 17, 1950, the congregation marched to the new site, the cornerstone was dedicated, and the name of the church was changed officially to Forest Hill Church, Presbyterian. For a week following the ribbon cutting at the new church on May 20, 1951, the congregation held welcoming festivities for the Forest Hill neighborhood and the Cleveland Heights community. In response to the rapid growth of Forest Hills and the FHC congregation, the church began offering two Sunday services in 1952. 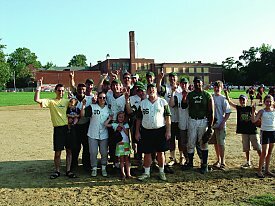 The current congregation may be interested to know that in 1947 the church entered a team in a Cleveland Heights church softball league. According to The Heights-Terian, the team manager reported that “at preliminary practices, the material looks good.” A tradition was born. 1953 to 1963 represented the pinnacle of Yoder Leith’s ministry at Forest Hill Church and was the peak period of membership for our congregation. When the new church building at Lee and Monticello opened in 1951, membership was 550. By 1955, just four years later, at the height of the Baby Boom, the congregation had grown to more than 1300. Suddenly, the building built only 4 years earlier was too small for FHC’s needs. Classes for the 600 children enrolled in church school were held everywhere, from the minister’s and other church offices, to the kitchen, to the Happy Day Nursery School in the house next to the church. With the obvious need for classrooms, the children of the church broke ground for the Monticello educational wing in 1955. It opened for use in 1956. The rapid growth in the congregation also necessitated an increase in staff and led to the hiring of Marideen Visscher in 1952 as Director of Christian Education and the Rev. Edward Couch as the Minister for Pastoral Care in 1954. In 1957, Ms. Visscher became only the 3rd woman ordained in the Presbyterian Church in the United States. Rev. Couch was replaced by Rev. William J. Murphey in June 1957, and then by Rev. George F. Mace in February 1960. Rev. Visscher left to head the Christian Education Department of the Cleveland Area Church Federation in September 1962, and in May 1963, the Rev. Ned W. Edwards began his long tenure with Forest Hill, as the Minister of Christian Education. Members continued to flock to FHC during the latter part of the ‘50s and early ‘60s, attracted by strong preaching, numerous church organizations involved in social and service activities, and programs such as the Forest Hill Cooperative Nursery School, which offered young parents a structured program for their children. The Hilltoppers, which first organized in 1947, became the primary organization of young married FHC couples in 1957. A sampling of the Hilltoppers’ program for 1960-61 included a presentation of Yoder and Virginia Leith’s summer 1960 trip through Europe and Russia, a visit to the Cleveland Playhouse, and a presentation by a Time magazine correspondent who had served in the Philippines during WWII. By 1961, church membership had grown to 2000 and there were almost 150 children under age 2, requiring an extensive Crib Room staff, including a registered nurse. Because the original sanctuary had been designed for only 312 worshipers, FHC began having three Sunday services in 1959 and still lined the aisles with folding chairs. Interestingly, the choir agreed to sing for all three services, but to avoid listening to three sermons, the order of worship for the third service was modified so that both anthems were sung before the sermon and the choir could quietly leave before the preaching began. As a result of the bursting walls on Sundays, a major building program began to take shape in the fall of 1961. In March 1963, ground was broken on the first part of a $550,000 building project, which added the Lee Road wing, Fellowship Hall, youth hall, additional classrooms, and eventually expanded the sanctuary to accommodate the overflow crowds. Forest Hill Church’s 7th decade began in the midst of its last major construction project. Worship services moved to Fellowship Hall in early 1964 to allow for the expansion of the Sanctuary. This effort involved moving the pillars, steps, and portico 15 feet towards the street, extending the rear wall 40 feet into the parking lot, and removing the church offices and a parlor to allow for the addition of the transcepts. The Lee Road wing and expanded Sanctuary were dedicated on Easter Sunday, March 22, 1964. In May, 1964, the 1950 Cornerstone was opened and then reset along with a new cornerstone box on June 7, 1964, containing current newspapers, coins, and a tape and bulletin of the June 7th service. On that date FHC membership stood at 1,965. Forty years would pass before the cornerstone boxes were reopened on June 13, 2004. In 1963, Yoder Leith was still the senior pastor, assisted by associate pastor, Ned Edwards. Under Rev. Leith’s leadership, FHC adopted several changes to the church’s governmental structure, including adding the Clerk of Session as a voting member and instituting a unicameral system that required at least three Trustees to serve on Session. In 1967, Virginia Bodwell and Ruth Jenks became the first women to serve as elders of FHC. The turbulence of 1963 to 1973 that marked American history was reflected in the changes Forest Hill Church faced during this decade. By 1969, church membership began to drop nationally: FHC’s membership declined to 1600 and its budget by one-third. The joint ministry of Yoder Leith and Ned Edwards, from 1963 through 1970, saw the Forest Hill neighborhood evolve from the restrictive elitism of its deed restrictions and exclusive “membership” policies to the brewing racial and social unrest of the civil rights movement and the Vietnam War. In 1970, Yoder Leith retired after 24 years and, in order to give the church time and space to consider its future, Ned Edwards resigned as well. The ensuing pastoral search was a pivotal period. In the spring of 1970, Rev. Ned Edwards was nominated to be the senior pastor. After a long debate at a congregational meeting attended by over 800 people, Rev. Edwards’ nomination was approved in a split vote indicative of the congregation’s polarity, mirroring the community and the country, over racially changing neighborhoods and the upheaval of the “generation gap” and the Vietnam war. Eventually, more than 35 families left the church, but a new energy and direction for FHC’s mission ensued. New programs were initiated with the aim of bringing members together in common tasks and fellowship, including the Parish Care system, “Parish Coffees” in the pastor’s home, and Lenten dinners as family gatherings and programs. Rev. Guy Volpitto, who served as interim moderator during the transition period, became Associate Pastor. He was joined by Associate Pastor Robert H. Barnes in 1971. With the Session’s adoption of the Confession of 1967 as a guide, the Board of Church and Society (now the Ministry of Justice & Mission) became a full standing committee of Session and in 1971 began to study the problems of integration and housing in the community. As a result of a housing seminar conducted by the Board, a plan was developed to establish the Forest Hill Church Housing Corporation, as a non-profit corporation to rehabilitate housing in Cleveland Heights and East Cleveland. Thus began a tradition of FHC as a strong participant in issues of the local community that continues today. In 1973, government assistance for rehabilitation of houses was discontinued. At this time, the Session of Forest Hill Church initiated the “Challenge Fund” which raised money by challenging other religious groups and businesses for the purpose of backing low-interest loans to Cleveland Heights’ residents who were unable to arrange conventional financing for home improvements. By the end of 1979, $250,000 had been raised, and loans totaling $180,000 had been made. In 1980, Forest Hill Church received the “Community Organization Award” from the Cuyahoga Plan for leadership in fair housing. In June 1973, the youth group went to Durand, Illinois, to present the folk musical Tell It Like It Is. Another youth highlight in April of 1975 was the ordination of the first youth to be elected as an Elder at Forest Hill Church. Although membership in 1980 had decreased to the level of 1953 (approximately 1000 members), Forest Hill Church remained a very active congregation. Many families who had left the congregation in 1970 began returning. Staff changes in 1982 included the installation of Rev. Daniel Kershner as Associate Pastor and Timothy D. Broadway as Organist after Margaret Hale Volpitto’s retirement. In 1983 change was bubbling under the surface in downtown Cleveland. In the next 10 years, the former Terminal Tower concourse, once a busy railroad station was transformed into Tower City Center. Construction began on a new stadium dedicated exclusively to baseball. And after a grassroots letter-writing campaign, the local coining of the phrase “rock ‘n roll” decades earlier led to the establishment of a world-class Rock ‘n Roll Hall of Fame and Museum in our city. During the same 10-year period, shifts and adjustments at the intersection of Lee and Monticello paved the way for progress for our congregation as well. In 1983, Dr. Ned Edwards was completing his first dozen years as Senior Pastor of Forest Hill Church. His ministry here, which continued until his retirement in 1992, ushered in a restructured Christian Education curriculum, new ways for the congregation to come together in fellowship and service, and even greater involvement in the community. His successor, Interim Senior Pastor Dr. Edgar R. Jones III, began serving Forest Hill in April of ‘92. During the same period, Associate Pastors changed, too, with Daniel R. Kershner leaving and, in 1987, Dennis Zimmerman named as Interim. Four years later, Rev. Matthew Peterson followed in the same role. In 1984, a new social group called The Pacesetters began meeting for fun and fellowship. The music department changed as well. For almost 30 years, the positions of Choir Director and Organist had been separate. B. Neil Davis led the choir in 1982, followed by Interim Gilbert M. Brooks, then Dean of the Cleveland Institute of Music, in 1985. Organist Timothy D. Broadway joined Forest Hill in 1982, and remained for 5 years. After that, Mary Ann Switz and Rowland Blackley each served for a year, with Anne Wilson becoming the church organist in 1989. Two years later, Paul McGahie was named Director of Sacred Music and remained at Forest Hill until 1993. During his tenure a new pipe organ was installed, and acoustical renovations to the Sanctuary were made. This ambitious building program, completed in 1991, also ushered in aesthetic changes in the sanctuary. But long-term debt and rising operating costs were becoming a problem. In 1992, the loss of Taylor Academy as a weekday tenant was offset by renting space to Raintree Academy. But a year later, the members found themselves searching for ways to reduce costs without cutting programs. Unwilling to shrink the Associate Pastor’s position to half-time , the congregation found a solution. Taking advantage of Director Paul McGahie’s departure in 1993, the positions of choir director and organist were combined. Happily for all of us who enjoy today’s spectacular music program, Anne Wilson was named to the new Minister of Music role. Dr. Edgar Jones joined us as Interim Senior Pastor in April, 1992, after Dr. Ned Edwards ended his 29-year pastorate at Forest Hill. He and Interim Associate Pastor Rev. Matthew Peterson worked to maintain a vibrant congregation. Their time with us ended in April, 1994 when the congregation extended a call to the Rev. Dr. John C. Lentz, Jr.
Dr. Lentz, whose undergraduate study at Kenyon College gave him Ohio roots, came to the church from an associate pastorate in Winchester, Virginia. Dr. Lentz showed the same commitment to social action as his predecessors, and worked to promote a real balance among the elements of the Christian life: worship and prayer, education and spiritual development, outreach and mission, and community fellowship. He has stressed that all of our activities need to stand on the foundation of the lordship of Jesus Christ. In 2003 he was awarded the Bernice Lott and Lacy Lott Memorial Award for Outstanding Citizen of Cleveland Heights/University Heights. Rev. Beth Herrinton joined the staff as Associate Pastor, completing the ministry team. When she left in 2001 to start a family, Rev. David Ensign served as Interim Associate Pastor. After Rev. Ensign left for a permanent call in Virginia, Rev. Anne McCabe replaced him. Both used their considerable gifts to enhance the church’s ministry. Anne Wilson continued in the combined roles of Director of Music and Organist for this decade, treating the congregation to a potpourri of music, from traditional to folk to gospel to contemporary, incorporating worship music from around the globe. She continued to provide wonderful opportunities such as the May Cabaret, where the choir members annually let their hair down. Another favorite during this decade was “Dueling Organists,” which drew members and neighbors to hear serious organ pieces as part of a good-natured competition. In 2003, Anne was commissioned by the congregation to write a piece of music for the centennial celebration. In March 2004 Anne’s new work, Song of Hope, was performed. Forest Hill Church reached a milestone in the program year 2004 – 2005, celebrating 100 years of ministry as a congregation. The celebration included a formal dinner in the fall, bringing back former pastors Ned Edwards and Bob Barnes, with home-grown radio and television personality Paul Tapié as the emcee. Many long-term members had the opportunity to share their memories with those in attendance. In November 2003, an “I Did – I Like” Art Show was held. Members’ artistic talents along with objects they liked and wished to share were showcased. 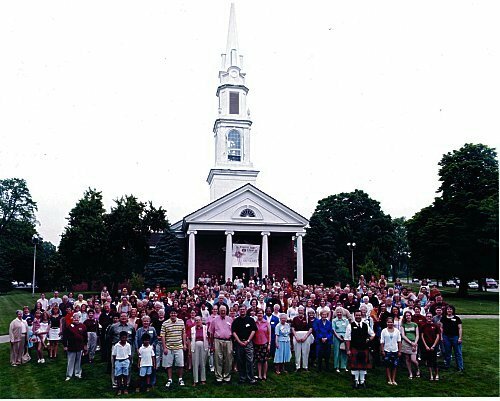 On June 13, 2004, the cornerstone boxes were opened with the contents on display for the congregation to peruse, and the congregation walked the few blocks to Superior and Euclid Hts. Blvd. for an all-church picnic at the Superior Road School House. One measure of the dynamic nature of the church’s direction is that in an era when mainline churches are losing membership, and inner-ring suburban churches are experiencing decline, the church’s membership was holding steady with weekly attendance up considerably. 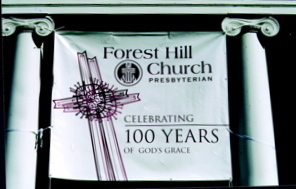 Forest Hill ended its tenth decade continuing to grow and pledging to remain a strong witness to Christ’s love for many centennials to come. The church’s second centennial began in May 2004 with the installation of Rev. Clover Reuter Beal as Director of Lay Leadership in an exciting new venture. Rev. Beal focused on adult spiritual development, education, gift discernment and outreach to the unchurched during her 11-year pastorate and helped institute the popular Faith Leader program to develop lay leadership at Forest Hill Church. Commitment to civic involvement continued and matured. The Forest Hill Housing Corporation, which had been started in the early 1970s under the leadership of member Diana Woodbridge, evolved into the Heights Home Repair Resource Center, one of the most respected civic organizations in the Heights area. The church continued its involvement with the Heights Community Congress, another organization formed in the 1970s to encourage civic involvement in making racial integration a positive development embraced by the community. The church received a Community Visions Project Award in 2000 for our Sister Church Program in which it joined with Heights United Presbyterian and Christ Our Redeemer A.M.E. for worship services and fellowship. Forest Hill became involved with a number of new initiatives, including East Side Interfaith Ministries, (eventually renamed InterAct Cleveland), dedicated to uniting religious congregations in social justice ministries; New Life Community, a group home offering a fresh start for women with children; and NOAH, the Northeast Ohio Alliance of Hope, a regional faith based organization seeking to work together to address systemic inequities which affect lower income people and minorities. The group worked to address such issues as unfair lending practices by financial institutions and shortsighted business decisions that removed accessible grocery stores from neighborhoods that would suffer without them. Forest Hill continues to develop the church’s facilities as an integral part of its ministry. Significant efforts have been made to improve the building, including creating the Joyce Crichley Hunter Courtyard Pavilion, a major refurbishing of Fellowship Hall, and a number of structural improvements. Access for persons with impaired mobility was improved with the addition of a ramp in the Hunter pavilion and a motorized chair from the second floor to the basement. Forest Hill also sought new ways to nurture the congregation. In 2003, the parish care system was reorganized. A number of small groups for prayer, book reviews, and Bible study were started. Notable was the Emmaus Small Group Ministry, in which members worked to understand scripture, foster strong relationships within their group, find each other’s spiritual gifts, and commit to prayer and meditation. Changes were also made to the youth and children’s programs. Scott Arthur joined the staff as Youth Director and was later joined by Amanda Osenga. Both did a wonderful job of getting middle and high school students involved. Several mission trips were arranged. Eight young people participated in the first one, and 45 on the most recent, showing wonderful growth in numbers, enthusiasm, and commitment by the youth of the church. The Ministry of Personal Growth began the Pathways to the Promise Land church school curriculum in 1998, repainted and re-supplied the education rooms, and named Debbie Wagner as the director. Pathways was a workshop rotation model with elementary school-aged children sampling different learning models around a common theme over several weeks. Similar changes were made in the programs for younger children as well. When Debbie’s family moved in June 2004, Liz Wollaeger continued in her position. In its 12th decade of congregational life, Forest Hill Church continues to serve as a beacon of faith in Cleveland Heights. 2014 saw celebrations of Dr. Lentz’s 20th anniversary as Senior Pastor, Anne Wilson’s 25th anniversary as Minister of Music, and Rev. Beal’s 10th anniversary as Associate Pastor. But changes were coming. In the summer of 2015, we sadly released Rev. Beal to accept a Co-Senior Pastorship at Montview Presbyterian Church in Denver, Colorado. Stepping in to fill the gap were Rev. Lois Annich and newly-graduated seminarian Rachel McDonald. A new Youth Director, Shannon Headen, and new Children’s Education Director, Kate Burleigh, were additional new faces. 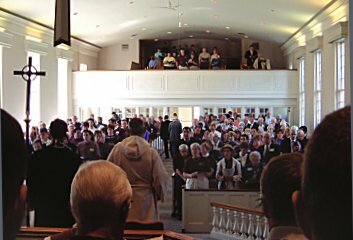 With a congregation of 500 members, average weekly worship attendance of 225, over 100 children in the various Sunday School programs, and one of the highest giving levels of any church in its Presbytery, Forest Hill Church remains committed to its mission of Discovering God’s call, Celebrating the Spirit’s presence, and Witnessing to Christ’s transformative power.